In October of 2018, I was approached by MINT Gallery (who I was interning with at the time) to create a public installation for the yearly Atlanta Streets Alive festival. This was my first ever public install so I recruited my friend and talented fabricator, Arielle Symone, to help conceptualize and actualize the piece. We spent weeks brainstorming something small, but impactful to bring to the festival centered around the idea of finding refuge and comfort in harsh and trying environments. Atlanta Streets Alive amasses thousands of people yearly, so we wanted to give people a place where they could briefly escape the commotion. Why not build a grow box for humans? Over the course of a week and some change we spent day in and day out of a (rather hot) storefront building out our triangular-take on what a human grow box might look like. 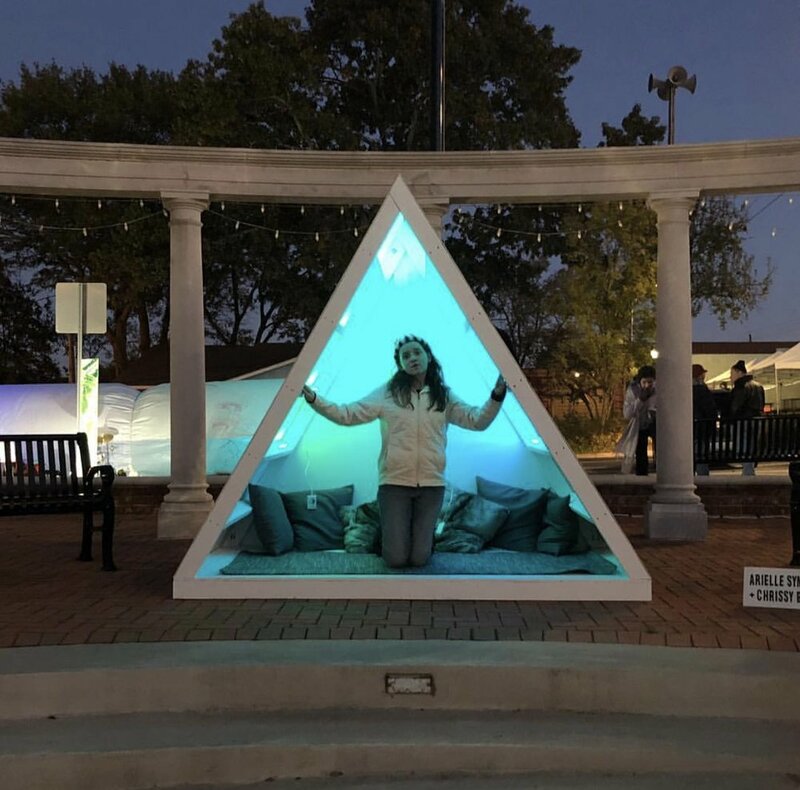 The piece was built completely out of wood (led by Arielle), painted, wrapped in mylar, and outfitted with pillows, carpet, and color-changing LED lights. (Left) The triangle being wired with color-changing LED lights. (Top) The frame of the triangle being constructed, led by Arielle Symone. The piece was displayed publicly the day of the Atlanta Streets Alive festival. The installation was also given a second run one month later at Dashboard’s Hapeville Gallery Crawl: 20?5.